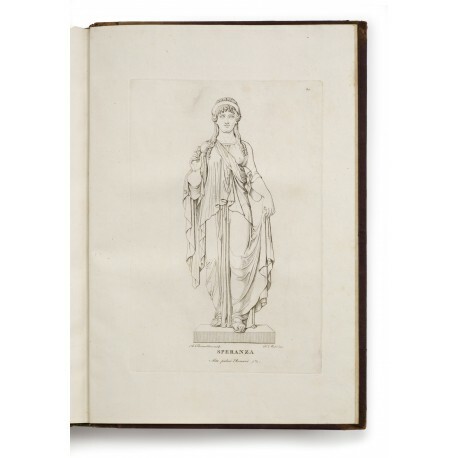 A series of line engravings documenting statues and reliefs produced in Thorvaldsen’s Roman workshop, eleven drawn and engraved by the brothers Franz (1786-1831) and Johannes (1788-1860) Riepenhausen, the remainder by the engraver-publisher Ferdinando Mori (1775/1782-1852). It is heralded as one of the earliest publications reproducing works by a modern artist, and responsible for focusing the attention of all Europe on the sculptor. Le Statue e li Bassirilievi inventati e scolpiti in marmo dal Cavaliere Alberto Thorwaldsen scultore danese. Disegnati ed incisi dai Riepenhausen e da Ferdinando Mori. 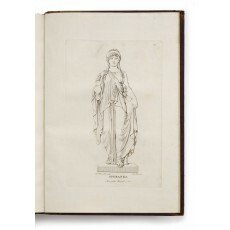 folio (420 × 280 mm), complete suite of eighty numbered plates (including title) printed on 78 folios (nos. 33–36 printed on two leaves); the matrices of varying sizes (largest 200 × 410 mm, smallest 190 × 135 mm), of which eleven (plate nos. 11–15, 18–21, 23, 31) are signed by the Riepenhausen brothers, and the remainder by Mori (except no. 63, unsigned). One plate trimmed inside platemark along one side, otherwise preserving broad margins, clean and fresh. binding contemporary German half-roan binding, the leather back decorated in gilt and blind and by an orange lettering-piece, violet cloth on covers. 1. On the dispersal of this library, see Kostbare Bücher aus drei alten fränkischen Bibliotheken: Bronnbach, Kleinheubach, Neustadt a.M.: Beiträge zur Bibliotheksgeschichte und Katalog des 1985 ersteigerten Bestandes, edited by Peter Kolb and Gottfried Mälzer (Würzburg 1988). 2. Brigitte Kuhn-Forte, in Zwischen Antike Klassizismus und Romantik: Die Kunstlerfamilie Riepenhausen, catalogue of an exhibition in the Winckelmann-Museum (Mainz 2001), pp.210–212, no. vii.8: ‘Das 1811 erschienene Stichwerk ist ein Meilenstein in der Geschichte des römischen Verlagswesens: Es handelt sich um eines der ersten Beispiele der Reproduktion des Oeuvres eines modernen Künst­lers… Es machte Thorvaldens Schöpfungen in ganz Europa bekannt…’. 3. Bjarne Jornaes, ‘Thorvaldsens “klassische” Periode 1803–1819’ in Bertel Thorvaldsen: Untersuchun­gen zu seinem Werk und zur Kunst seiner Zeit, edited by Gerhard Bott (Cologne 1977), pp.49–106 no. 34 and fig. 11. 4. Mori’s drawings are Thorvaldsen Museum, Copenhagen, Drawings D159–189 (corresponding to pls. 2–6, 8–10, 16, 22, 24–25, 27–29, 32–37, 40, 43, 49–50, 52–53, 55, 57, 59–62, 77). 5. The first two (of seven, or eight?) distribuzioni seem to have been issued simultaneously. The first was comprised of the title and ten plates (Giasone [frontal view]; Giasone [side view]; Briseide consegnata agli eraldi di Agamennone; Ganimede; Apollo; Bacco; Venere; Psiche; Amore e Psiche); the second contained eleven plates (Il Battesimo; La Madonna; Gesù Cristo; La Gloria; Apollo che suona e le muse danzano intorno alle tre Grazie; Ebe; Frontone; Ercole ed Ebe; Esculapio ed Egia; Prometeo e Minerva; Giove e Nemesi). The prints were enclosed in a printed wrapper: Collezione delle statue e de bassirilievi inventati e scolpiti in marmo dal cavaliere Alberto Thorwaldsen scultore danese. Cf. Maria Vittoria Marini Clarelli, ‘L’opera di Thorvaldsen nell’editoria romana dell’ Ottocento’ in Bertel Thorvaldsen: 1770–1844: scultore danese a Roma, edited by Elena di Majo (Rome 1989), pp.308–312 (‘le dispense o distribuzioni furono sette’). 6. The contract between Thorvaldsen and Mori survives in the Thorvaldsen Museum, Copenhagen, Letter Archives, m3 1813, nr. 9 (http://brevarkivet.thorvaldsensmuseum.dk/letters/m31813,nr.9; link). As the work progressed, Mori submitted proof impressions of his engravings for Thorvaldsen’s approval. Thirteen such impressions (before letters, most with pencil annotations) are in the Thorvaldsen Museum, Copenhagen, Graphic Works by other artists, E75l–p, E75r–y (corresponding to pls. 2, 11–12, 16, 23–24, 30, 40, 45, 64–65, 67, 69). 7. Adding to the series eleven prints comprising the presumed third distribuzione: Adone; Ettore che rimprovera Paride; La nascita di Venere; Amore ferito dall’ape; Mercurio portante Bacco alla nurice; Amorino; Amore; Bacco che porge da bere ad Amore; Carità; Amore e Psiche; Marte. 8. 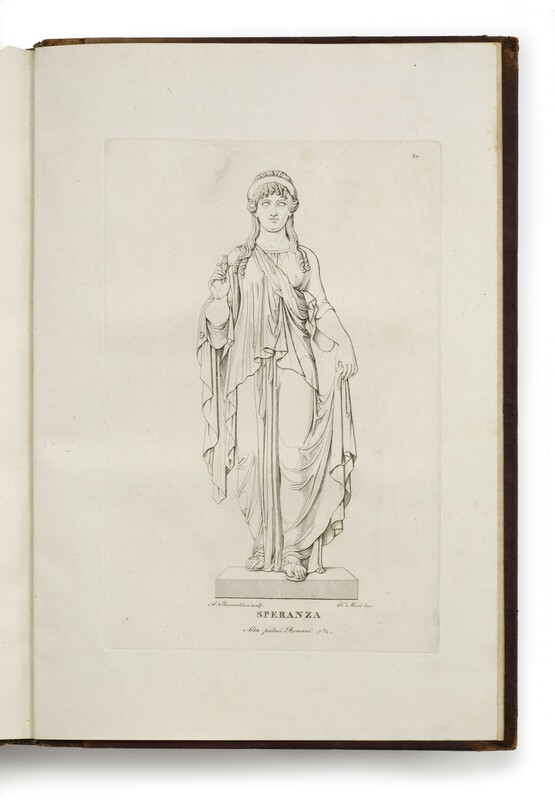 Plates 33–54 document the Alexander frieze and were initially considered a ‘supplement’ to the work. 9. The ‘4a Distribuzione’ was circulating in August 1813 (cf. letter of Mori to Thorvaldsen in Thorvaldsen Museum, Letter Archive, m3 1813, nr. 17; and for contents, m4 1814, nr. 24). 10. 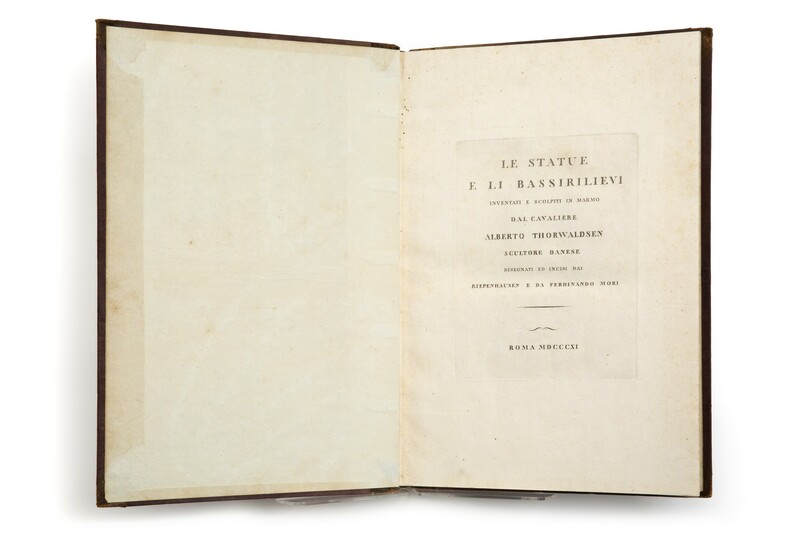 The ‘5a Distribuzione delle Opere’ was circulating in April 1816 (cf. letter of Mori to Thorvaldsen in Thorvaldsen Museum, Letter Archive, m4 1816, nr. 14). 12. A Catalogue of books in the library of the Royal Academy (London 1877), p.279 (‘Parts 1, 4, 5’). 13. Copy exhibited Zwischen Antike Klassizismus und Romantik, op. cit., pp.210–212 no. vii.8. 14. Copy described by Marini Clarelli, op. cit., p.309 (with reproduction of its title-page).